Green, J.C. & Jordan, R.W. (1994). Systematic history and taxonomy. In: Green, J.C. & Leadbeater, B.S.C. (eds.) The haptophyte algae. Clarendon Press, Oxford: 1–21. For more multimedia, look at Haptophyta on Wikimedia Commons. Hibberd D.J., 1972. Chrysophyta: definition and interpretation. British Phycological Journal 7: 281, . Parke, M. & Dixon, P.S. (1976). Check-list of British marine algae - third revision. Journal of the Marine Biological Association of the United Kingdom 56: 527–594. Christensen, T., 1980. Algae: a taxonomic survey. Fasc. 1. Odense: Aio Tryk as. Jordan, R.W. & Green, J.C. (1994). A check-list of the extant Haptophyceae of the world. Journal of the Marine Biological Association of the United Kingdom 74: 149–174. Edvardsen, B., Eikrem, W., Green, J. C., Andersen, R. A., Moon-van der Staay, S. Y., & Medlin, L. K. (2000). Phylogenetic reconstructions of the Haptophyta inferred from 18S ribosomal DNA sequences and available morphological data. Phycologia, 39(1), 19-35, . Order Phaeocystales Medlin ord. nov.
Jordan, R. W., Cros, L., & Young, J. R. (2004). A revised classification scheme for living haptophytes. 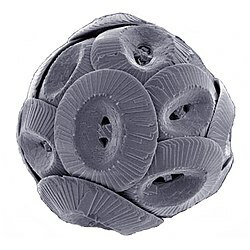 Micropaleontology, 55-79, . Subphylum 2. Heliozoa Cavalier-Smith subphyl. n.